The following was the complete text of President Charles M. Vest's Welcome Address to the Class of 2002. Welcome to the future - your future. I am Charles Vest, president of MIT. And you are the MIT Class of 2002! Now, I know what you are thinking, and it's not true. You were not admitted by mistake. You are not here as the result of a computer glitch, or the report of an incompetent educational counselor. You are not here because we needed more architecture majors or people from Montana or because someone misread your SAT scores. You are a member of the freshman class at MIT because we believe - we know - that you have the intellectual capacity, the energy, the imagination and the personal will to succeed here. We are very proud and excited to have you as students - and I hope you are proud and excited to be here. Two years ago, arriving freshmen took special pride in being the first class of a new millennium. Last year, the Class of 2001 took pride in being the Class of 2001, a year which, thanks to Arthur C. Clarke and Stanley Kubrick, will always have deep resonance in the worlds of science, technology, and the popular imagination. Who would have thought that, by the time you reached MIT, the 21st century would already be old hat? But don't be downhearted. Careful statistical analysis suggests that the Class of 2002 will be as historic, as impressive, and as remarkable as its predecessors. Plus - you're better looking. One of the oldest clich�s about MIT is that this is the place where the future is invented - and, like most clich�s, it is true. In one sense, MIT and other great research universities invent the future because our students are the future. You are the legacy we pass on to a world which urgently needs your creativity, intelligence and expertise. We care deeply about you; indeed, our success is measured by your success. The other - and most immediate - way that the future is invented here is through the work done every day by our faculty and, to a remarkable extent, by our students -including our freshmen. Including you. 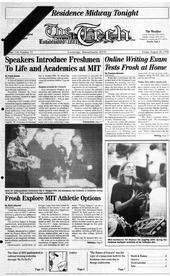 Freshman year at MIT is not a rehearsal, or a dry run. This is as real as it gets. By the work you have already done, in your schools and in your home communities, you've proven that you can make a difference in the world around you. The next four years aren't preparation or training for your career. Your career has already begun. This fundamental truth about MIT is reflected in the fact that many of our most accomplished faculty members began their life's work as MIT undergraduates. It is also reflected in the way that undergraduates - including freshmen - not only participate in serious research, but also contribute actively to the process of their own education. Here at MIT, we all learn together, and we all solve problems together. It is a self-evident reality of modern life that - whether as a small academic community in Cambridge, Massachusetts or as a global society making its way on a fragile planet - the challenges we face are so daunting and complex that we cannot hope to solve them without collaboration. You, the members of the Class of 2002, are an important and valued part of the MIT collaboration - so don't be shy about plunging in. First, the Undergraduate Research Opportunities Program (UROP). This is a way for you to work with faculty and graduate students, as part of their research teams. Most students do this at one time or another, although usually not as first term freshmen. Second, the Freshman Advising Seminars. Over 80 percent of you have opted to join one of these seminars - which are taught by faculty who will also be your advisors. Few students in America have the opportunity to gather for a couple of hours every week with a half-dozen other freshmen and a world-renowned faculty mentor - and spend that time talking about ideas, trying out hands-on learning, and exchanging insights about life issues. Your freshman advising seminar is a unique opportunity to do just that. I hope you will take advantage of it from the outset. Third, the special Freshman Programs - Concourse, the Experimental Study Group, and the Integrated Studies Program. Each of these covers the basic first-year subjects - but does so in the setting of a small and close-knit educational community. I urge you to look into these alternative programs. You may find that one of them is just right for you. In all of this, frequently, you will be the one to help a fellow student grasp a difficult concept, or refine a promising idea. And, outside the classroom, you will have the opportunity to help your fellow students and the larger community in a host of public service, arts, and cultural programs. In these, and many other ways during your time at MIT, you will contribute to the building and strengthening of an extraordinarily rich community of learners. Of course, there is an enormous pay-off for all these contributions: The more you put into MIT, the more you'll get from it. First: Learning at MIT occurs in many places and takes many different forms: learning by formal study and teaching; learning by disciplined research; learning by designing, building and operating, and working on real problems; but, above all, learning from each other. Second: MIT is a place that values hard and effective work. I will be very honest about this. We expect you to study and work hard on things that matter. And this is true whether you major in engineering, the physical sciences, the humanities or social sciences, architecture or management. Third: MIT thinks about and works on "big" subjects - major issues facing humankind - ranging from cancer research to industrial productivity, from global climate change to urban design, from the evolution of new artistic expressions to the refinement of political and economic philosophy. Fourth: The power and beauty of rational thought - of science, engineering and logical analysis - permeate everything we do. We know that the universe remains full of possibility and mystery, and that the ability to acquire and pass on new knowledge is the defining characteristic of our species. Indeed, 28 MIT faculty, graduates, and staff members have earned Nobel Prizes in the quest for knowledge and understanding. � We do not know, even in principle, which aspects of climate are predictable. � We do not know how we learn and remember, or how we think and communicate. � We do not know how to transform materials without creating waste by-products. � We do not know how and why cells die, or why tumor cells migrate to new sites in the body. � We do not know how to convert solar energy into practical, cost-efficient fuels. � We do not know how old the universe is, what it is made of, or what its fate will be. Of course, MIT is not preoccupied solely with these large-scale areas of investigation. The utility of logical and systematic inquiry goes far beyond the topics most people think of when they hear the words "research," "experiment," and "discovery." For example, this year's Freshman Orientation itself is an experiment for MIT - and a very important one at that. Several aspects of this year's Orientation programs are brand new. They include, among others, this afternoon's "Health in Sports" symposium, tomorrow's Residence Midway, and the presentation on the nature of community offered next Thursday night by Dr. Richard Keeling of the University of Wisconsin. In addition, we have, for the first time, asked MIT undergraduates to serve as Orientation Leaders and help steer you through this hectic and important week. All of these innovations are designed to improve your understanding of the options and opportunities that lie before you in your first year at MIT. They are also intended to reinforce your sense - and our sense - that we are in this together. As you will be discovering throughout the next week - and in years to come - MIT is not only a collection of exceptional individuals, but also a community that can support and sustain each of you. This university has always been very good at stressing the value of rugged individualism. We challenge our students: we tell you to think for yourselves, to question authority, to follow your instincts, and to take chances in the pursuit of your personal and professional goals. All of these aspects of life at MIT are critical to your intellectual development. At the same time, however, we expect you to use good judgment, common sense and compassion in the ways you express and fulfill your individuality. We know that you already possess compassion, good judgment, and common sense in abundance. You wouldn't be here if you lacked them. On the other hand, it is equally true that every year, at MIT and other colleges across the nation, students do things that hurt themselves or others. When this happens, it is often because they foolishly suspend their common sense, good judgment, or feeling of connection to a supportive community. Do not let this happen to you. During the next week, you will be making new friends and, beginning Saturday, choosing a place to live. Once you do, cherish those friendships and become an active member of your living group. Be both a recipient and a giver of mutual support and community. Care for each other. Some of you have already signaled your desire to do so by taking part in the Freshman Leadership Program - but all of you have the ability. Remember also that, if you need help, advice, guidance - from your teachers, your fellow students, or from any of MIT's administrative staff, the smart thing to do is ask. I am sure that all of you are familiar with Sir Isaac Newton's famous words of self-deprecation, "If I have seen further, it is by standing on the shoulders of giants." No matter how smart you are, no one expects you to figure everything out on your own. If you aren't here to benefit from the wisdom, experience, and intelligence of others, then there's no point in being here. Finally, I hope you will make every effort to get to know one another - especially those who come from regions, nations, or backgrounds unlike your own. Unfortunately, "diversity" has become a catch phrase, but the fact is that diversity, in many dimensions, is essential to the infrastructure of a 21st century education. Over and over, we hear from our graduates how they benefit from - and value - the range of people with whom they lived and learned while here as students. � You come from 46 of the 50 states and from 48 nations outside the US. � Twenty of you have transferred to MIT from other institutions. Welcome! � Forty-two percent of you are women. � You come from an extraordinary array of ethnic, racial, economic, cultural, and religious backgrounds. This diversity is part of the richness of MIT's learning environment. Immerse yourself in it, be nurtured within it, and you will be a better student and a better person. In the end, however, remember that all of you are alike in one central and critical respect: You are well-qualified to excel in one of the most demanding academic environments in the world. You've all got "the right stuff." You are here because you have the intelligence, the talent and the drive to change the world. You are ready to take charge of your future - and perhaps the future of the entire planet. I know you will achieve extraordinary things, both at MIT and in the larger world while you are here, and as you continue in your careers. So work hard, have fun, and - precisely because you are so full of promise and ability - please look out for, and take care of, yourselves and each other.